Kevyn Orr helped oversee has described Detroit's fiscal woes as the "Olympics of restructurings." 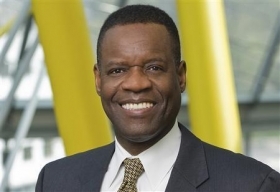 DETROIT (Bloomberg) -- Kevyn Orr, Michigan Governor Rick Snyder's pick to take control of Detroit, will probably need every ounce of experience he gained helping Chrysler Group LLC reorganize to create a plan for the Motor City to survive. Orr, a bankruptcy lawyer and University of Michigan graduate, was formally appointed to the job Thursday after being introduced publicly by Snyder at a news briefing. In 2009, the Jones Day partner helped Chrysler win $4.96 billion needed to restructure and streamline operations by cutting 789 dealers. "When I heard his name, I thought, 'This is a great break for Detroit,'" Spencer Overton, a law professor at George Washington University in Washington and friend of Orr's, said in an interview. "Kevyn Orr brings so much to the table." Orr, 54, arrives with the city of 706,600 teetering on the verge of bankruptcy. Detroit ran up a deficit of almost $327 million last year and has $14 billion in long-term obligations. Growing gaps in services have frustrated residents while potentially rancorous union negotiations are approaching. In all, not a dissimilar situation to the one he found at Chrysler in 2009, when it lost almost $3.8 billion. With U.S. government backing, the automaker went through a bankruptcy in which Fiat SpA took control of the suburban Detroit manufacturer's attractive assets and the rest were liquidated. Chrysler's net income soared to $1.67 billion last year, from $183 million in 2011. Fixing Detroit will be unlike fixing an automaker, yet he'll draw on that experience, Orr told reporters Thursday. He quit Washington-based Jones Day to take the Michigan job. A native of Fort Lauderdale, Florida, Orr said he expects to complete his work in Detroit within 18 months. "I undertake a job that needs to be done, that has a fuse on it, and if I do a good job, I get fired," Orr said. "Can I get the job done? I am highly motivated. I am all in." Chrysler, which when it entered court protection in April 2009 was the largest industrial bankruptcy ever, took 41 days to exit the process amid predictions it might take years. "He quickly got attuned to the political dynamics of the Chrysler bankruptcy, and you will recall there were many," said John Bozzella, who was the company's vice president of external affairs. "He'll need those kind of skills. He understood the political sensitivity well." Detroit may be Orr's biggest challenge. The city has lost more than a quarter of its residents since 2000. Those who remain endure unreliable buses, inadequate police and fire protection and broken street lights. Orr said he's a lifelong Democrat who's prepared for controversy as protests of his appointment took place outside the Detroit building where he was introduced. "In my business, you're sort of the undertaker that walks up to the front door," Orr said. "You might say I've been inoculated against the concept that people aren't exactly happy to see me come along." He has described Detroit's fiscal woes as the "Olympics of restructurings." Orr will be a hands-on manager who won't just rely on advisers, said Overton, the GWU law professor and a Detroit native. His wife's parents still live in the city. Orr said he'll meet with Mayor Dave Bing, a Democrat, aides to Snyder and City Council members to set priorities. "There's no doubt in my mind that we're going to work together," Bing said at the news briefing. City residents, he said, "want things fixed. That's what we've got to focus on." Alan Fein, a lawyer in Miami, described Orr, a former colleague, as well-liked, with a charming demeanor. He said Orr is "an honest broker, and fair to the core." "He's a great facilitator, he's a smart guy," Fein said. "He's somebody who walks in the room and you want to know him and like him." Fein said Orr and his wife, Donna Maria Neale, have young children, and a cat. Orr said Donna is a surgeon. The family has a house in the Washington suburb of Chevy Chase, Maryland. Before joining Jones Day, Orr held several U.S. government jobs, including director of the Justice Department unit that oversees bankruptcy cases and trustees, according to Jones Day. While Orr said while he'll look for consensus, he'll do what needs to be done. When some Chrysler creditors balked at cutting the company's bank debt to $2.25 billion from $6.9 billion, his team took the automaker's case to bankruptcy court instead. In the briefing Thursday, Orr described bankruptcy as a "cudgel" weighted in favor of municipalities. He said he wouldn't rush to use it. "Let's get at it and work together," Orr said of state and city government officials. "Because if we can't resolve this, people of good faith, don't make me go to the bankruptcy court. You won't enjoy it."